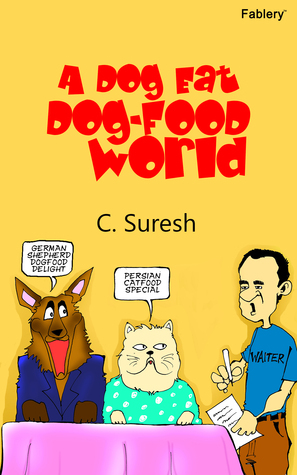 Author Suresh Chandrasekaran has written marketing management satire ‘A dog eat dog food world’. I asked him who was his inspiration as a humorist author. Read his answer in his own words. If one is to leave joke-books out of the reckoning, there are very few humor writers in the history of English literature. Not to be wondered about, since humor is arguably the toughest genre to write. When you write tragedy or romance or action/adventure, it is possible for you not to hit bull’s eye with the writing and still be interesting. But, is a joke ever acceptable unless it provokes laughter? Shakespeare has written his comedies; even Charles Dickens wrote the Pickwick papers; Jerome K Jerome wrote his funny ‘Three Men in a boat’; Mark Twain entertained with his humorous wild west tales and even the ‘Connecticut Yankee in King Arthur’s court’; Oscar Wilde wrote scintillating humor plays; Richard Gordon wrote his humorous doctor tales; but, for me and for a vast majority of humor readers, there is one man who stands head and shoulders above the crowd – Pelham Grenville Wodehouse. P.G. Wodehouse is, arguably, the only humor writer who created worlds of his own and set story after story in those worlds and kept you enthralled. A world where the displeasure of aunts caused nephews to steal cow-creamers; the well-being of a pig stiffened the spine of a dreamy peer and caused him to unite loving hearts, despite his dread of his sister’s masterfulness; a devotion to golf measured the character of men and women; where a castle had impostors like others had ghosts and so on. In the hands of any lesser writer, these tales may have merely seemed silly but in the hands of P.G. Wodehouse…ah…in the hands of P.G. Wodehouse, it is the reader that is putty, carried along helplessly laughing and giggling as tale after tale ends in a resounding comic climax. The wonder of his writing is that never once do you laugh with the guilty feeling of laughing AT someone. He makes you laugh indulgently at the antics of his characters, without once evoking in you a sense of judgmental superiority. AND the magic of his plotting! How could one man ever, in one lifetime, plot immaculately so many stories where the problem needing solution is comical and the solution comes in a comic climax? Bar P.G. Wodehouse, no-one has ever written EVERY story where the story idea itself is comical. Wilde had his ‘Importance of being Ernest’, and so others may have written a book or a play, but most humor writing has been a humorous rendering of a tale that may otherwise be told seriously as well. Or a humorous travelogue and/or humorous rendering of real life events, like Jerome K Jerome. Not so with Wodehouse. In that, I could probably rate him the only true humor fiction writer. Lost in his humor, it is easy to lose sight of his absolute command over the English language. The perfection of his choice of words, his vast repertoire of quotes, which he misuses to great comic effect and his superb dialogues have to be read to be experienced. If, indeed, there is one complete humor writer, it is the maestro of humor – P.G. Wodehouse! I agree wholeheartedly. P.G. Wodehouse is to humor what Agatha Christie is to whodunnits. As it happens, both are my favorites authors. What about you? Which author is your favorite in humor writing? If you have read Suresh’s book A dog eat dog food world, what did you think of it? Read my review of the book here. This post is a part of book tour for The Book Club. A hilarious pseudo-history of marketing management, which explicitly denies resemblance to any actual history, and which will be horrified if some semblance be found. ‘A dog eat dog-food world’ is the story of a man who discovered that the path of life is strewn with treadmills and, if you get on one by mistake, you could keep running all your life to stay in the same place. The story of how just minding your own business can lead to unexpected consequences, guided by the ‘invisible hand’ of long dead economists. Anything you learn from the book – be it the basics of marketing management or a satirical view of Society – you do at your own risk. The tale only dogs the doings of Spike Fortune who only sought to feed dogs and Jerry Fortune who, being fortuneless, gets dragged helter-skelter by his uncle Spike’s careening pursuit of commercial success; Spike’s rival Tom Rich, who is unwillingly dragged into upstaging Spike and tries to do it by teasing the palates of cats, helped by the bumbling efforts of his nephew, Jasper Rich who would rather be chasing girls than chasing cats. He reignited his passion for writing with a fairly popular blog www.jambudweepam.blogspot.in. The blog has been rated among the Top 5 humour blogs in India, twice in succession – in 2014 and 2015 – by BlogAdda, and has also been listed third among the Top Humour Blogs by Baggout. Follow The Book ‘s board A Dog Eat Dogfood World on Pinterest. Thanks, Summerita, for showcasing my piece in your space. You’re very welcome. Thanks for sharing your thoughts.